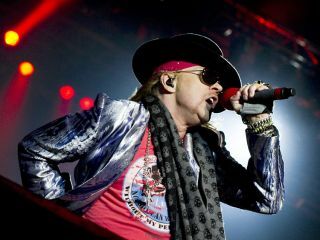 All Guns N' Roses tour dates (not) "officially cancelled"
Axl onstage in 2010. Roadie backstage tweeting from his iPhone? Rock's biggest pantomine continued in earnest last night. All of Guns N' Roses' forthcoming tour dates - including their UK Reading Festival headline slot - were thrown into question by an announcement on the @AxlRose Twitter account stating that "all upcoming Guns N' Roses dates are officially cancelled". The full tweet, posted around 11pm BST, was as follows: "All upcoming Guns N' Roses dates are officially cancelled. Please contact your place of purchase for any refunds." At present, it is unconfirmed whether this is a genuine tweet by Axl Rose, with no official statement on the Guns N' Roses website, and a post from the GN'R Twitter account stating: "We are looking into this tweet from the @AxlRose witter account. Please RT + keep with us here for official word. TY"
Some hopeful fans are speculating that Rose's Twitter account might have been hacked. However, if we'd hacked it, we'd probably have posted something more imaginative, along the lines of "Just hooked up with Slash, Izzy, Duff and Steven. Appetite shows confirmed. Reunion tours FTW LOL".